First of all, the decision should be made on the basis whether you are looking for an MTB brake or a road bike brake. Furthermore, the brake types are then distinguished by their funcitonality, namely whether they work hydraulically or mechanically. Hydraulic brakes offer a better performance and a higher braking force at relatively small exertion of force at the lever. Mechanic brakes are less susceptible (sturdier) to damage than hydraulic ones but offer less braking force. Some force is lost due to the friction of the braking cable within the sleeve. Cyclocrossers and inexpensive mountain bikes often use mechanic disc brakes. Hydraulic brakes are not only more expensive to purchase but servicing them, e.g. bleeding costs quite much and takes time. Let's give you a short overview over the different variants which are available in regard to the subject of the bike brakes. More and more often, you'll also find disc brakes on the road bike. 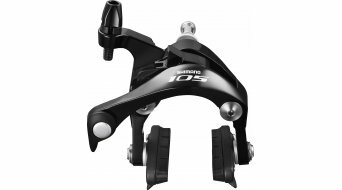 The disc brake has triggered a real technological revolution since formerly, the rim brake and/or the side-pull caliper brakes used to be the exclusive standard on the road bike. But this seems to change as well. Especially for cyclocross, the disc brake is on the rise since it plainly spoken scores with more bite and reliability on cross-country tours. Not to forget, there also are hydraulic rim brakes, available as MTB as well as road bike rim brakes , although you'll not see them very often on road bikes. They are praised for their great modulation of braking force, and that mainly at bad weather conditions involving wetness. You'll find more details in the respective named categories. 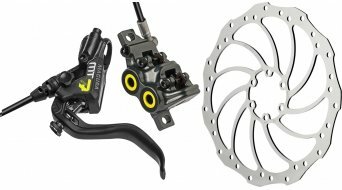 Whether road bike or mountain bike brake, in our online shop you'll find the brake which fits to you and your bike at favourable prices, that goes without saying! DOT is a very thin hydraulic fluid on polyglycol base. It often is erroneously called brake oil or DOT oil, but from the chemical point of view, it is not an oil compound. The boiling point of this fluid is extremely high and at the often used DOT 5.1 it amounts to about 260°C. The disadvantage of DOT is the characteristic that it connects well with water and thus is hygroscopic. That is why brakes with DOT-fluid "draw" water, which considerably reduces the boiling point. Therefore, we recommend a yearly oil exchange in order to guarantee the safety and an optimal functionality. Mineral oil is a fluid from fossil raw materials. It is not hygroscopic and has a boiling point of approximately 190°C. !!ATTENTION!! Under no circumstances may DOT and mineral oil be mixed since they have different properties and can attack seals and lines and thus endanger the safety and functionality of your brake. It is roughly distinguished between organic and metallic (sintered) pads. As the names already tell, the organic friction surfaces are of organic materials and the sintered friction surfaces are of metallic compounds. Organic pads preserve the brake rotors a little more than metallic, but they are more susceptible to high temperatures. Metallic pads can stand higher temperatures and are being used for MTB and extreme purposes. They work better at higher temperatures and in total last a little longer.